I'm having issues with my new Nikon D3200. I am new at photography, but I've previously used my parents camera (a Canon) for my brother's senior photos, and those were crystal clear. I've got this camera and have been doing lots of research and put it on manual... switched the settings on diff things, and they're still blurry. They seem to look good viewing them on the camera, but viewing them on the computer... not so much. Makes me sick. I had two photo sessions outdoors this past week and many of the photos look that way when you zoom in. What am I doing wrong? Is my Nikon defective? I have the 18-55 lens, plan to get another one 55-220 or something in the next few days. I had ISO set to 200 and aperture at, like, 4.5, I think. Shutter speed at 1/250. I was told to do the settings at all those by a photographer, but I don't know exactly the details. I had the VR turned on... as well as the M for manual. I haven't used a tripod. One thing that is odd to me is that some of the pictures look better as I zoom in than the actual pic. Then some look really blurry/soft like the further I zoom. To be honest, they all are a tad blurry no matter what. I used photoshop and sharpened them and made a huge difference, but it still wasn't what I wanted. I had the metering set on matrix on one session and on center weighted on the other. Outcome was the same. I created a flickr gallery if someone could please go and look at the photos I posted. This gallery has labeled examples of all of the problems I am seeing. This is something I need help on ASAP as I have a session coming up soon. The "before" photos haven't been altered. I opened them up in photoshop to save them as a jpeg because Flickr would not accept photos in raw format. You're seeing the effect of a smaller depth of field, which is more apparent with a larger sensor size. In this example, you are shooting at f/5.6 and 26mm, and it looks like you're pretty close to your subjects. You're focusing on the little girl's face, or maybe even a bit closer, and everything away from that plane naturally falls out of focus. For more depth of field, stop down more. You can also probably get better results by focusing a little further back into the picture, so everything is more in focus on average. I think you're looking too critically at your new photos and not critically enough at the examples from your parents' camera. First, yours has a lot higher resolution, so when you zoom in all the way, you're zooming in a lot more. Second, the point and shoot camera is applying a lot of noise reduction and sharpening in-camera, and the results look fine at first glance but actually have lost a huge amount of detail. I certainly wouldn't say they look better than what you are getting. If you make normal-sized prints (8×10, say), they all should look fine, and similarly they look fine at web viewing resolution. Your focus is a little off in some of them. But again, I don't think it's a deal-breaker. Sharpness is overrated. To improve, though, try to be a little more careful with where you put the focus points, and make sure to lock focus and avoid recomposing after that when you are close up — better to put an alternate focus point directly on the subject's eye if you can do it. Again, this is more important because of the higher resolution and shallower depth of field of the more capable camera; the point and shoot isn't any better at this, but you can't see the difference as well. All that said, do be aware that you are using a budget, entry-level lens. It won't give you miracles, and while these class of lenses are generally decent performers, if you put them to "stress tests" and look for defects, you'll never be happy. And kind of unrelated but it's hard not to say something: whatever post-processing you are doing to the eyes in this one seems really strong, crossing over into the uncanny valley for me. Your taste may differ, but I'd suggest toning it down. Camera shake. There's an old rule about using a shutter speed "faster" than the lens's focal length. If the lens is zoomed to 125mm the shutter speed should be 1/125 or faster. Setting a shutter speed slower than that results in blurry photos because the camera moves as the shutter is released. Depending on how steady you are and any image stabilization capabilities of the camera / lens you may need to set a faster or slower shutter speed. If the EXIF information for DSC_0098 is accurate this photo was taken at 1/60, f5.6, ISO 400 with the lens at 69mm (35mm equivalent). Since the lens is zoomed in quite a ways the aperture of f5.6 is probably the "fastest" (letting in the most light) that it can be. You have three options to reduce camera shake (faster shutter speed): increase the ISO which might result in unacceptable noise, use a flash to stop motion and provide more ambient light, or buy a lens with a larger (faster) maximum aperture like f2.8. If you want to stop any subject motion (like the skirt moving sideways) you need an even faster shutter speed. Focus wrong. It's impossible to know why the focus is in the wrong location. Is the focus mode set to manual? Is the focus mode set to automatically determine what point to focus on? In DSC_0285closeuptinted you can see on the lace covering her lower right arm that the focus gets better as it extends towards the camera. When shooting portraits try setting the focus mode to single shot using only the central focus point. You can then aim at the subject's eyes, press down part way on the shutter button to focus then recompose the shot. Depth of field. Only one plane in the photo can truly be in focus, everything else is not in focus. 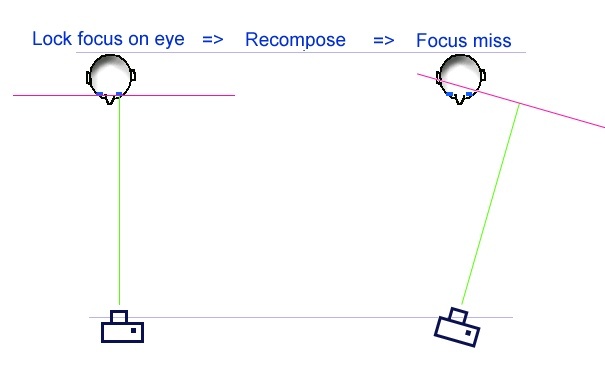 You can improve how much appears to be in focus by "stopping down" the lens and using a smaller fstop (bigger number). In DSC_0227benchdaybreaktonesg the family extends away from the camera. To improve this photo you should adjust your focus technique: decide what is the closest thing that should be in focus and the most distant thing that should be in focus. Focus on a point that is about 1/4 of the way behind the closest focus. Stop down the lens, there is actually an optimum depth of field (DOF) and in the olden days a scale on the lens would have helped to set it, now you can: get a DOF calculator app, preview the DOF if your camera has a stop down button, shoot and review, or wing-it! In this case you probably need f16 or f22 to get decent DOF. Note that the smaller you make the aperture the slower the shutter speed or the higher the ISO you'll need. Too much post-process sharpening. Sharpening increases noise in an image. Purists would say that you should only use sharpening to adjust the image for different media (monitors, LCD screens, prints). Sharpening will not change wrong focus, though in small focus errors it might appear to improve focus depending on viewing conditions. For your upcoming shoots you can reduce the chance of errors by keeping it simple and upping the complexity as you get the hang of things: keep everyone in the photo the same distance from the camera, choose locations with bright light (usually not direct sunlight), understand the different focus modes on the camera and use one where you know what will be in focus, practice with a friend or family member to be sure you've got the camera setup correctly and can get the results you want. I've been shooting for decades now and I still have to practice regularly to keep up my focus / exposure / composition skills. Keep shooting and asking questions, you'll get the hang of it. For just one example, in DSC_0100 I see sideways camera shake. And since this one is in portrait orientation it makes me suspect that the sideways camera shake came from your finger pressing the shutter release button. Do not "push" the shutter release button, instead squeeze it. Just like you would squeeze to dry a wet sponge with your whole hand, or, at least between the button finger and palm of your hand, forget the other fingers. 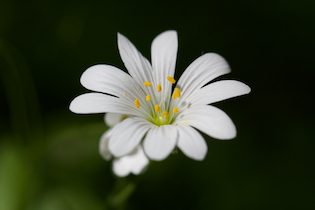 Focusing is another thing that you must re-learn after using a compact camera. Locking exposure and focus by pressing the shutter release button half-way and holding it there is a nice feature, but you are not supposed to do any great changes in composition or even move the camera too much. See the picture (below) how just turning your camera can cause focus miss. 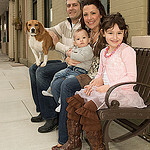 The bench armrest and the little girl are in focus, but the depth of focused area is rather shallow with system cameras. You can improve this by using smaller aperture (here in the photo it was f/5.3) to make the out-of-focus areas appear a bit "sharper". One more problem in self-evaluating your photos is the down-sizing to fit screen. 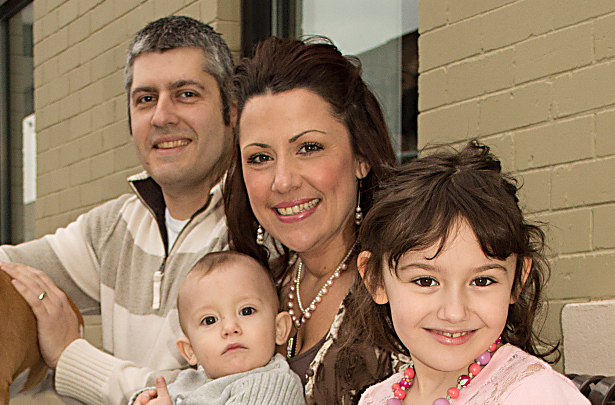 For example the DSC_0209 photo (family in front of a brick wall) the photo is sharp at 100% pixels size (zoomed in on your screen), but as it is 6000 pixels tall it must be downsized on-the-fly to fit the full photo on your screen. There it matters a lot which kind of resize algorithm is used by the viewer software. You will get better results with the downsize tools found in a proper photo editing software. For more about this, read the answers to "How can one determine the ideal resampling algorithm for a given type of image?" Viewing a picture on the tiny LCD on the back of your camera is a poor indication of how it'll look at full size on a computer monitor. Checking the histogram can help you to determine if the exposure was good (how it looks on the LCD notwithstanding), but there's not an elegant solution to seeing if you nailed the focus and/or minimized camera shake. What you can try to do is zoom way in on the intended area of focus and see how sharp it is, but even then, when viewing such a small patch, it can be difficult for a beginner to determine if the loss of detail is from missed focus or simply the limitations of the sensor/resolution. If you do notice something obviously wrong, though, it'll be a lot less frustrating to take another picture a few seconds later than to open up the picture on your computer long after the fact with no way to salvage it. It's possible that you're experiencing front-/back-focusing issues with your particular lens, and unfortunately the D3200 doesn't have an autofocus fine tune setting like Nikon's higher-end models. But before attempting to speak authoritatively on the problem you're seeing, it would be helpful if you could post examples of what you're talking about. But at 1/250 shutter speed and 200 ISO, I'll say that it's unlikely to be camera shake or noise from the ISO setting. Dont expect sharp images out of camera when you "zoom in too much". In small prints and fit to screen it should be sharp after your basic crop, but don't crop too far in. Especially with a cheap lens. Sample shots are often taken with better lenses (40mm F2.8). Even 3rd party reviews put better lenses on for their IQ tests (Sigma 50mm F1.4). The skirt of the girl looks motion blurred as well (yep, 1/50s with 45mm is too slow). The image with the family is focused in front instead of the 1/3 vs 2/3 depth. Also be careful when you sharpen, not to sharpen the out of focus background, as it looks really fake. Because you have set aperture to 11, you should have the paper 100% in the field of focus. If the pic is blurry still, perhaps the lens is faulty. Do this test with another lens. If the pic still is blurry, it could very well be the camera. I won't discount the camera or lens immediately. Try to use the lens with another body and see how it goes; try your camera body with another lens as well. Did you test the same setup with a tripod? Also, there are several other settings that need to be taken care of. I bought D5100 (my first DSLR) and it took me more than 6 months just to understand what each of the settings do. EDIT 1: Noticed the tag; are the pics in NEF format or JPEG or both NEF and JPEG. Nikon does all sorts of things there. All of the Nikon lenses I've looked at support both Auto and Manual focus. Take a look at the left side of the lens and you will see a slider switch labeled A and M. That sets the focus mode between Auto (A) and Manual (M). Also to note, the kit lens offers their stabilization technology (VR) which is right below that. Go ahead and set that to the On position which may also help if you aren't so steady. Not the answer you're looking for? Browse other questions tagged dslr sharpness shooting-technique or ask your own question. What is the meaning of “stopped down”? How to shoot sharp “landscapes” with a point and shoot camera?